My friend, who went backpacking with me (see our adventure), recommended this book: The Great Alone. In this story, there is a mother and her daughter who live in Alaska and their husband/father is abusive. He is also a prepper, so they have Bug-Out Bags ready by the door. (I call mine a 72-hr bag, but closely the same thing). Hm...is this why she thought I would like the book? Either way, while creating a plan to escape from him they factor their Bug-Out Bags into their plans. Without knowing it, the abusive husband gave his daughter and his wife the single backpack they needed to run away from him. Quite handy. But this isn't just a Bug-Out Bag...it's a I've Never Coming Home Bag (INCH). For the woman in the story, it's their Run-Away Bag (RAB? Nah. ) but could be similar to an Evacuation Bag. They don't expect to come back home, but they also don't expect to need to survive out of the backpack in the Alaskan wilderness. They board a plane and head off to seek shelter with relatives. Warning: It's an emotionally raw book, if you are thinking about reading it: The Great Alone. Of course, this got me thinking about the absolute essential things I would want if I had to evacuate. If my life was in immediate danger, and I had to leave, what would I want in my backpack? I am thinking strongly about creating this bag for just inside my apartment door. I keep my 72-hr bag in my car, which I often go to for mundane things like bug spray or bandaides. I check my bag so things don't go missing, but using the items keeping them rotated. This bag can be put together with things already around the house. Putting it together before you are stressed and need to leave will give you time to gather and consider your absolute essentials. What would be in your absolute essential bag? Let us know below. 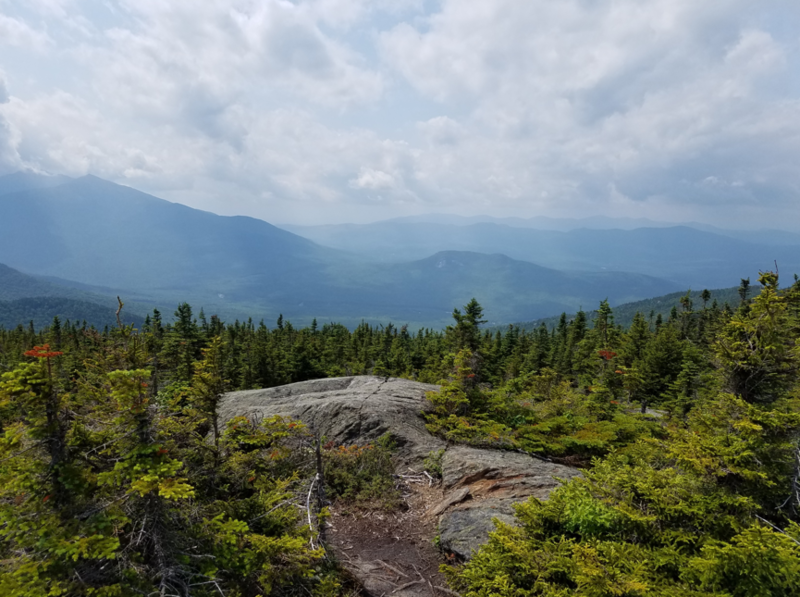 At the beginning of July, I went on a 4 day/3 night backpacking trip in the White Mountains of New Hampshire. I traversed Mt. 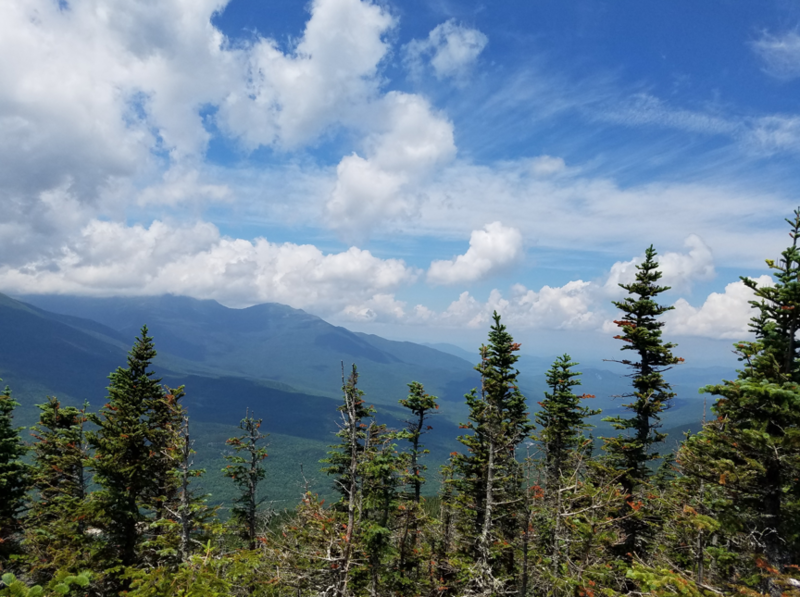 Moriah, Carter Dome, Carter Notch and then summited Wildcat mountain. I also found myself, upon return, answering the same questions about bugs, food and water. Here are my lessons learned. While it would be rustic to light a fire and cook over it, anyone who has done so hungry knows it takes a long time. Also with leave no trace, a roaring campfire burning up the dead underbrush isn't so friendly to the forest. All the backpackers I saw, and us, carried small camp stoves. These small stoves attached to a fuel canister, and regulate the flow. Ignite the fuel, and you are ready to cook. Before we left, we prepacked Norr pasta sides + instant potatoes in Ziploc plastic bags. When we were ready to cook, we boiled water and poured it into the bag. We let it sit there, cooking the pasta, and the potatoes absorbed the excess moisture. After 10-15 minutes your food is hot and cooked. Your cooking container is clean, aside from heated water, and your plastic bag can be tucked away to carry out. Sanitation can be difficult on the trail as there is less clean water available. All clean water must be filtered or carried in. Often times our go-to method to clean something is to wash it in the sink with tons of running water. Out in the woods, things are more difficult but not impossible. But you can brush your teeth just the same. You can rinse off in a lake. You can bring along some toilet paper or just shake dry. On my first day, we passed a group of 3 gentleman all over the age of 70. They were hiking down the same mountain we were and they all had knee-braces on. I noticed their use of hiking poles and knee braces but didn't think anything of it. As I was climbing down the mountain on the second day, I understood it all. My knees were killing me from the downhill stepping over rocks. My stabilizer muscles were fatigued from supporting all my weight un-evenly balanced on one foot as the other stepped down a rock. But the end of the first major day of hiking, my knees were swollen and largely refused to move. I hear hiking poles can help take some of the stress off you knees, and maybe the knee braces help too. Either way, it all made sense why someone who has been hiking for 40+ years would wear double knee braces. The rocks that damaged my knees! Alrighty, bugs! As a kid I got eaten alive at summer camp, the bites would swell up bigger than quarters, and I would itch them until they bled. My body seems a little less attractive to mosquitoes now, but I still think I taste better than average. That being said, I was a little worried about backpacking. Especially, watching everyone just put bug spray on and sleep in an open 3-walled shelter. However, after the first night I was amazed. I had no bug bites! We applied bug spray 3 times a day: first thing, about mid-day as we sweated it off, and right before bed. I sprayed my hand then wiped it all over my face, ears, and neck. While this left me sticky, I also managed to come out from a 4 day hiking trip (never in a bug proof shelter) with only a few bites. I was using Ben's Bug Spray. My friend told me she was carrying 3 bandanas with her while backpacking. I thought she was a bit crazy, and maybe that was just her thing. But then I started to learn why cowboys and soldiers carry bandanas. They are so versatile; to wipe sweat, to clean things, hold things. She used one as cushion to prevent things moving, one as a pot holder, and one as a sweat rag. They might just be up there with Duct tape, WD-40, and balling twine. Every ounce adds up to pounds and every pound slows you down. "Count your pennies and the dollars take care of themselves." Similarly, count your ounces and the pounds will take care of themselves. Lightweight gear can be more expensive, but your body will thank you. Leave your "extra just in case" at home, your body will also thank you. I would say I am an average, in shape human. I go to the gym, eat (mostly) healthy, and enjoy a good hike on the weekends. 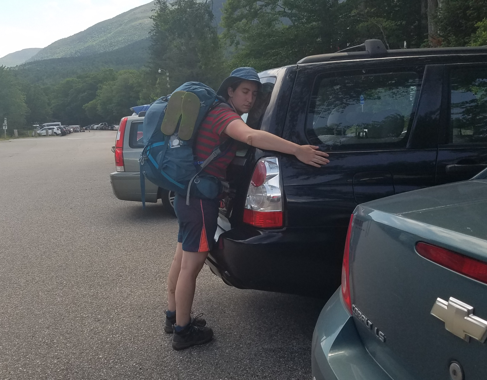 That being said, going on a backpacking trip where everyday was physically grueling, I had no idea what to expect for mileage per day. My friend Marian hiked 700 miles of the Appalachian trail, so she had a better idea and planned the trip for us. I am a turtle with Lyme disease slow, I know it. 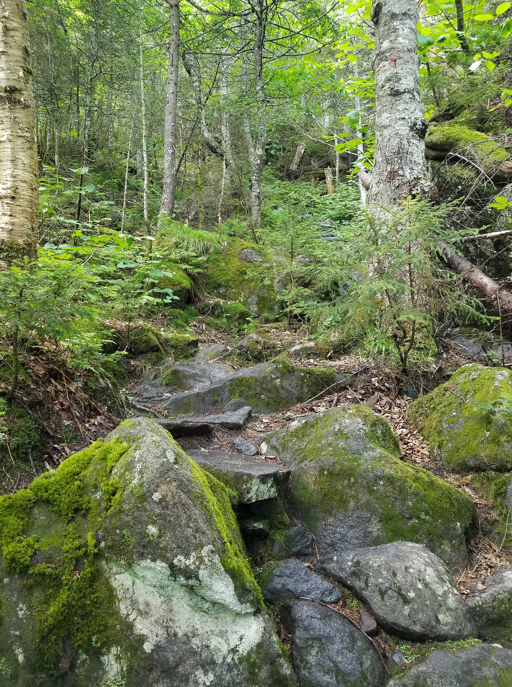 When going up rock stairs and rocks climbs, I averaged less than 1 mile per hour! On flat roads or nicely maintained paths I could probably get closer to 3-4 miles per hour. This trip gave me a good understanding of my physical capabilities at the moment. I can now expect my body to be able to travel 5-20 miles a day (assuming 7-8 hours of walking). This knowledge is useful when planning Get Home Routes (Get Home Safe: How to Pack a Get-Home Bag) or weekend hiking trips. Learning is always important and now I know first hand more about myself, the human body, and the reasonable distances one could travel in a day. You really need less than you think to survive. I was actually surprised to find, I used nearly everything in my pack. (I didn't use my compass, my warm hat/gloves, first aid kit, or my knife.) However I would not have removed those items from my pack just because I didn't use them on my only backpacking trip. But I was quite impressed by Marian's packing skills, in making a true essentials list. For living in the woods for a few days, you really need less than you think. If I had to survive in the woods for much longer, I may want other comforts but I had all I needed. See my packing list below. 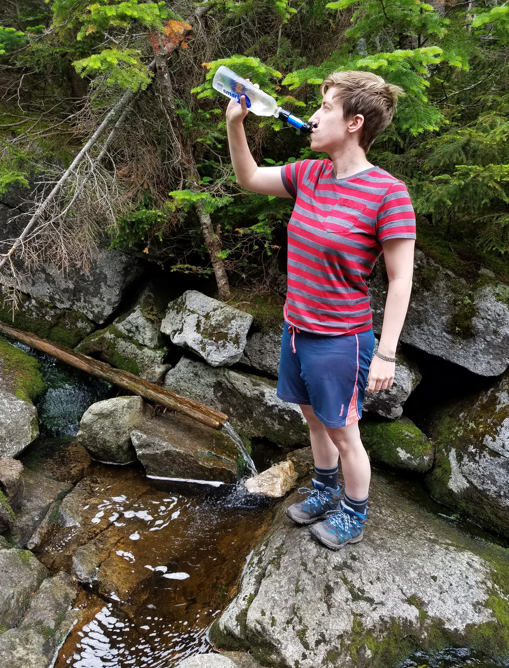 We were backpacking in a region where water was abundant in trail side streams and lakes. All one needed was a container and away to make the water safe. (What you Need to Know About Water: Collect, Purify, Store). We both carried the Sawyer Water filters with a Smart Water bottle. Cleverly designed, the Sawyer filters screw on to almost any commercially available water/soda bottle. We (like many others) choose to bring along Smart Water bottles because they are durable for the trail but easier to squeeze than a more rigid soda bottle. Screw the filter on, and drink or squeeze the water through the filter to create cooking and cleaning water. That was all that stood between us and water-borne diseases. It also seems to be the preferred system for the thru-hikers doing +2,000 miles on the Appalachian trail. Don't know who said it first, but somewhere on the internet I heard: "Every time you drink water, you reset a 3 day death clock." Drink your water folks, but make sure it's clean! We got some great views! That is the reward for backpacking, and hiking grueling mountains with swollen knees. The view and the accomplishment at the top of the mountain. I'll stop talking and just show a picture. 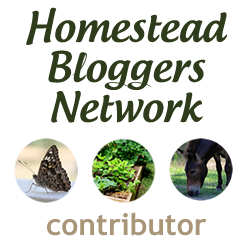 I know when I was getting ready to start hiking, I looked at blogs online to learn. I found the shear about of different options, opinions, and gear list overwhelming. My friend provided me a list she uses, and showed me one way to backpack. There are of course multiple ways to accomplish the same survive-in-the-woods goal. You have to find gear and a method that works for you. We made it out alive! For public transit commuters or even car commuters, do you have the supplies you would need to get home if your transportation failed you? Do your have a get home bag? For example, during the attacks on 9/11 all public transportation was shut down. Subways and buses stopped running, the roads became gridlocked with traffic and abandoned cars. People were forced to walk from their offices to their homes, often through ash and dust and debris on the sidewalk. A backpack that is easy to carry and has only the supplies you think you will need to get home or to a place with more supplies. It should be extremely lightweight, comfortable and blend in with panicking mobs. Perhaps this bag will be kept at the office or maybe in your car. For some people their 72-hr bag and their get home bag may look similar. For some who live too far to walk, the get home bag will be of little use, and they will need their 72-hr bag. I live 8 miles from my work, and drive my own car. The average person walks 3 miles per hour, therefore it would take me 2.6 hours to walk home. If I first discovered my lack of transportation when I got out of work at 5pm, I would reach home at about 7:45pm. September through March the sun will set before I reach home; making this walk mostly, if not completely, in the dark. Route is an important consideration. How do you plan to walk home? Try to avoid major congestion areas with many stranded or gridlocked cars. As people panic, they will look around for help and you don’t want to be caught in a mob. If your commute includes major highway, you will have to plan for walking friendly roads. Avoid major shopping and transportation centers where people may gather. When choosing, a backpack be sure to pick on that fits and is comfortable for walking long distances. Also, pick on that blends in, this is not the time to find a military bag from surplus. Likewise, a red backpack would imply medical supplies which will draw the attention of injured folks along the road. Choose a bag that fits your personality so you can blend in naturally. So what to pack for an extended urban hiking trip across town? Keep your bag with you always when commuting. 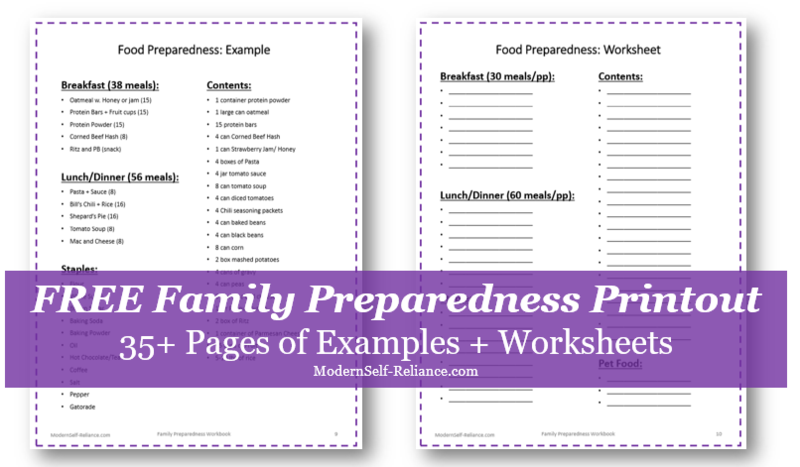 Is there something you keep in your Get Home Bag I should consider adding to this list? Thanks for stopping by!